At thyssenkrupp Elevator, our commitment to reducing the environmental footprint of our products, processes and operations is embedded in our culture and mindset. In fact, it lies at the heart of our sustainability approach. The surge in urban populations is unstoppable, putting a strain on space and resources. To address this surge and preserve green areas, city environments are increasingly dense and vertical. That’s why buildings need to offer greater efficiency and comfort than ever before. Global energy demand will increase by 20% to 35% over the next 15 years with cities accounting for two-thirds of this increase (see also: Urban Hub). 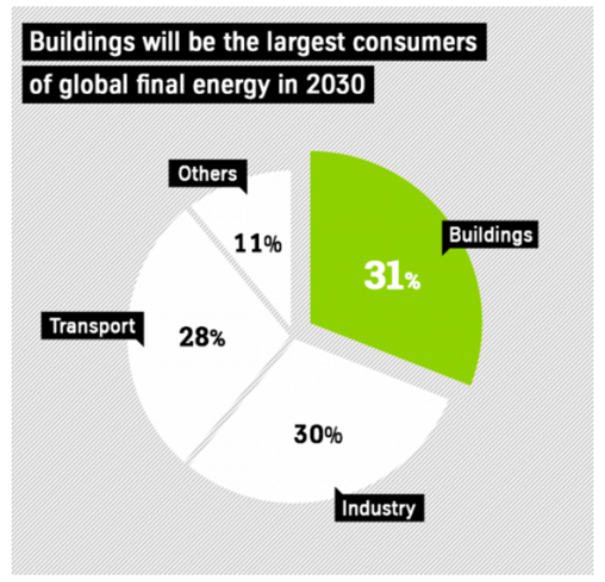 In urban environments, buildings are the biggest consumers of energy. Our innovative technologies and modernization packages help you drive down this consumption. New technologies such as our TWIN elevator – two independently operating cabs in the same shaft – can reduce energy consumption by up to 27% and cut electrical power requirements in half while increasing usable floor space by as much as 30%. Elevators can also drive a building’s energy self-sufficiency. At the new One World Trade Center in New York City, our elevators’ regenerative drives supply enough energy for the building’s entire lighting system. Refurbishing older elevators can lower energy consumption by up to 70% and extend an elevator’s use phase by an additional 25 years. 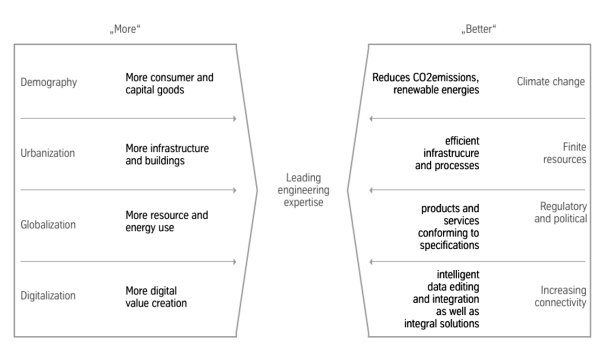 "Today’s energy inefficient buildings simply cannot cope with our rising energy needs. The decisions we make today affect the future of cities. It is imperative for urban development to remain forward-thinking and focused on sustainability – for the benefit of generations to come. The expertise and products already exist; the only challenge is to upgrade our building stock more quickly." The production phase followed by the use phase have the highest impact within the impact categories. 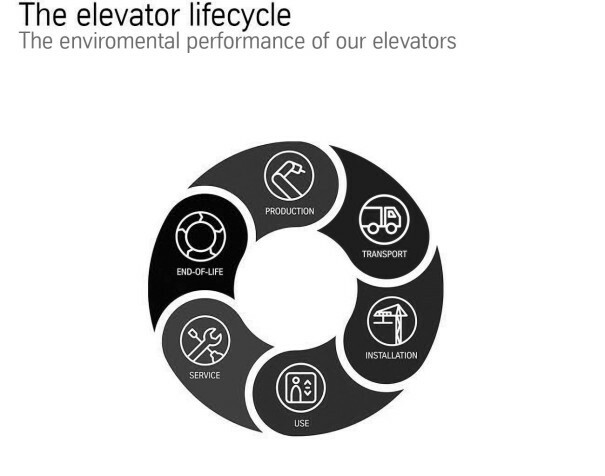 Additionally, a substantial environmental credit is given to the end-of-life phase by recycling of steel components, which represents the third most important phase in the elevator life cycle. Transportation, installation and service are less significant stages in the life cycle. We strive to make cities better places to live by making our passenger transportation systems more sustainable throughout their entire lifecycle. We’re embedding sustainability into our core business by investing in customer solutions that support green building certifications like LEED and BREEAM. We’re helping transform the industry with innovative solutions such as MAX, ACCEL, TWIN, MULTI and more. They reduce the energy, space, resources and on-site maintenance required by elevators, making buildings smarter and more efficient. Our R&D teams take pride in designing greener products and fostering strong partnerships for innovation. These activities are guided by Life Cycle Assessment (LCA) studies based on the ISO 14044 standard. Some of our products, such as iwalk and ACCEL, are also certified to ISO 14006, an eco-design standard that ensures we take environmental aspects into consideration throughout the design process. Globally recognized LCAs enable us to measure and improve the environmental performance of our products throughout their lifecycle. These programs support sustainable buildings by promoting lower energy consumption, creating environments conducive to human health and well-being, and reducing environmental impacts throughout a building’s entire lifecycle. They also help us do our part to make a net-zero-energy future a reality. Our passenger transportation systems are currently installed in 1,000 LEED-certified buildings. In 2015, our facility in Middleton, Tennessee, became the world’s first elevator manufacturing site to receive LEED Gold certification for “Existing Buildings: Operations and Maintenance.” Continuous improvements in resource efficiency and environmental impact at the 50-year-old plant drove this achievement. "As we move forward, we’re going to see more and more buildings that reach for a higher standard than even LEED." In addition to our Groupwide Energy Efficiency Program (GEEP), the ISO 14001 environmental management system (EMS) standard guides our efforts. As part of thyssenkrupp AG, our goal is to implement ISO 14001 at all environmentally relevant manufacturing plants and field offices by fiscal year 2019/2020. Today more than 35 thyssenkrupp AG sites are certified to ISO 14001, with more to come. In fiscal 2013/2014, all thyssenkrupp AG businesses committed to the GEEP program and related targets. At thyssenkrupp Elevator, we set a target of achieving energy efficiency gains of close to 60 gigawatt hours (GWh) by fiscal 2019/2020. This is equivalent to the average annual energy consumption of 12,000 four-person households. We’re using the ambitious ISO 50001 energy management standard to drive energy improvements. Our target is to implement ISO 50001 for all relevant activities, that is, stationary activities (excluding our fleet) with an annual energy consumption of above 10 GWh. ISO 50001 certification is under way at all of our European manufacturing sites, that is, two in Germany and two in Spain. Systematically managing the energy used in our production and service processes is enabling us to make good progress against our target. Modernizing plant components, installing highly efficient lighting and optimizing our fleet’s fuel consumption are key drivers of our energy and resource efficiency.